Discounted Returns!?! What is this all about? Want your return done by a CPA, CA (Chartered Professional Accountant, Chartered Accountant) but can't afford CPA, CA prices? As the saying goes - you can have your choice of quick, a low price or high quality but only two out of the three! My work is always high quality but if you are willing to give on the quick part I will give you a low price. 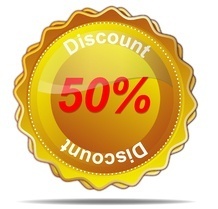 Discounted pricing is 50% of standard pricing which is what most clients pay. Please note that for very basic personal Canadian tax returns you will be required to upgrade to standard pricing if I have to request additional information at the beginning as the discounted price for this is so low already that it does not allow for correspondence back and forth looking for missing information. My other types of returns have some additional time built in to them for basic correspondence back and forth including getting missing information but generally do not include time to prepare amendments if you missed some information or received letters from the Canada Revenue Agency that you would like me to respond to on your behalf. Discounted tax returns will be completed as time permits around other work that is standard or premium pricing but before the filing deadline if you will owe them money to ensure that no late filing penalties are assessed. Returns which have all information submitted on or before March 15th, 2019 will be completed on or before May 1st, 2019. If you are submitting your information after March 15th and want it completed before May 1st for sure you must choose standard pricing. You may still choose discounted pricing after March 15th if you are very sure that you will not owe any taxes. I will not be responsible for interest or penalties if you miscalculated, chose discounted pricing after March 15th and I did not get to it until May. Once the Canada Revenue Agency authorization has been received I will check the information supplied initially to see if it looks like everything is there. I will email you a quick note to let you know we received everything, have access to Represent a Client if you need a Canadian return of some sort done and that you have been added to our list of discounted returns to be prepared. If anything appears to be missing I will let you know at this point. Additional time for my assistant to answer basic questions/file an adjustment/respond to the Canada Revenue Agency on your behalf may be purchased in 15 minute blocks for $25 + GST/HST. I will check all work done before it is sent to you and/or the Canada Revenue Agency. Additional time for me to answer questions on the phone for more complicated questions that my assistant will not be able to answer may be purchased in 15 minute blocks for $60 + GST/HST. Discounted returns will not generally get worked on until all standard and premium returns have been completed or are waiting on additional information from the client unless the discounted returns are within a week of the filing deadline. In that case they have equal priority with standard returns. If I have finished all the standard and premium returns before the May 1st deadline for regular Canadian returns I will complete as many discounted returns as I can on or before May 1st. Any discounted returns received after March 15th will be completed in the order they were received in the first few weeks of May. If you need a very basic Canadian tax return or a basic Canadian tax return then be sure to check out the free returns page to see if you qualify for a free return! You have all your information ready before March 15th, 2019. You want a Chartered Professional Accountant to at least look at it but can't afford my standard prices. My assistant will be preparing your return and I will be checking his work to be sure that he has done it properly. You don't usually have any questions because your return is very straight forward. My assistant will answer any questions you may have about your return via email to the extent that he can do so within the amount of time allocated to your type of return. I will be checking his responses to your questions before he sends them to you. If you are likely to have lots of questions you should choose standard pricing to start with. If you choose discounted pricing and end up having lots of questions you will be charged more before the return can be e-filed. Additional charges will be authorized by you before they are incurred. See above for rates for additional time. You are sure you have all your information and you very rarely get pre-assessment or processing letters from the Canada Revenue Agency. To take advantage of the discounted rate you must make sure that all your slips are on the My Account system before you purchase returns of this type. A regular Canadian tax return but with self employed income is due June 15th, 2019. A spouse of a taxpayer with self employed income is also due June 15, 2019. Note that rental income is not self employment income for the purposes of the extended deadline. Any money owed however is due April 30th (not extended to May 1st) so if you think you might owe money you should make some installments before April 30th. Any over payment will get refunded when your tax return is filed. Canadian returns can not be extended but no penalties are due if nothing is owing on the due date with the exception of non-resident rental returns. These absolutely must be filed by July 2nd or the Canada Revenue Agency will not allow any expenses to be deducted and will charge tax on the gross income at a flat 25%! A 1040 return if you are in the U.S. is due April 17th, 2019. This can be extended by filing an online extension and I reserve the right to do so without consulting you if I am very busy that week and your return is not done yet. Extensions can be filed for U.S. returns until Friday, October 15th, 2019 if needed. When should I not purchase a discounted return? If you have foreign assets with a cost of more than $100,000 that will require you to file your return on or before April 30, 2019 or face very nasty late filing penalties. You should purchase at least a standard return. If you are not sure whether you will owe anything and it is after March 15th you should purchase at least a standard return. If you have a lot of questions to ask me! You should purchase at least a standard return. You want it done quickly! You should purchase at least a standard return. You qualify for free returns!